Join librarian Michael Bowman for these upcoming fall workshops. See our complete list of workshops here. 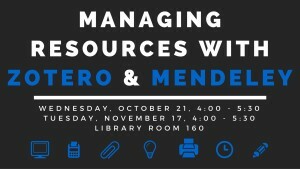 Zotero and Mendeley are web-based and desktop citation and PDF management tools that make it easy to collect, organize and cite research materials. Both are terrific tools for anyone working on a research project, as they can help you manage your research materials from multiple sources and insert them into your publications with ease. 10/21/2015 4:00 – 5:30 p.m.
11/17/2015 4:00 – 5:30 p.m. Learn how to efficiently review and manage information of all types. This covers software such as RSS readers, read later programs, note taking and storing applications and citation management software. 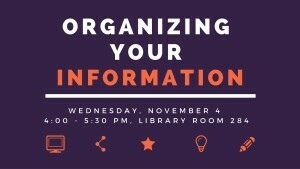 11/4/2015 4:00 – 5:30 p.m.
Want to learn skills that will boost your research and your career? 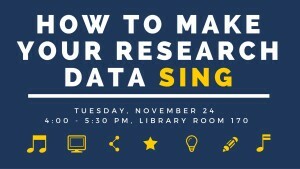 What do you need to consider when you’re working with research data? Learn about file formats and organization, documentation so you can reuse your data later, and metadata to prepare for deposit in a data repository. Please email Michael Bowman if you plan on attending and let him know what department you are in. That will help him prepare discipline-specific examples. Registration in advance is only being requested for the data management workshop. 11/24/2015 4:00 – 5:30 p.m.